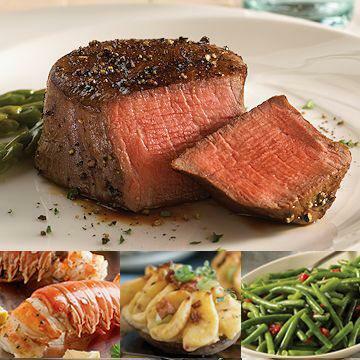 A steak and lobster dinner is perfect for all those special occasions in life. Savor the delicious flavor and exquisite tenderness of Filet Mignons then feast on the sweet and succulent Lobster Tails. Completing your feast are Stuffed Baked Potatoes and Asparagus Spears With Hollandaise Sauce. Meal serves 4..
Gas or Red Hot Charcoal Grill - Preheat the grill on high. Lightly oil and season steaks. Refer to cooking�times below. Allow 3-5 minutes resting time before serving. Apply finishing sauce or glaze if desired.Preheated Oven Broiler - place pan 2-3 inches away from the broiler heat source. Broil: Thaw lobster tails in refrigerator. Preheat broiler, position top rack 3-4 inches from heat source or preheat grill to medium. Butterfly tails by cutting down through middle of hard shell with a sharp knife. Cut through flesh but not underside membrane. Hold tail in both hands and open flat. Brush lightly with melted butter or olive oil. For broiling, place lobster tails on broiler pan shell side down. Broil for 6-7 minutes. For grilling, place flesh side down on grill and cook for 7-9 minutes, flipping when necessary if flare up occurs. Stove Top: From frozen; bring 2 quarts of water to a boil in large saucepan. Remove plastic wrap from frozen tails and place in boiling water. Return to a boil, reduce heat to a simmer and cook tails for 12-15 minutes until meat is opaque in color. Ingredients: Lobster. Contains: Shellfish (Lobster).